Every now and then, a motorhome comes along whose sheer design brilliance makes you wonder quite how no one else has come up with the idea before. And while the Chausson Flash 610’s on-paper spec might not make you stop dead in your tracks, seeing one for yourself in the metal is pretty much guaranteed to slacken your jaw. Externally, the biggest change from previous Flash models is the sight of a Ford Transit base vehicle rather than the more familiar Fiat Ducato. All 2015 Flash low-profiles are available from the factory in either guise, but most, if not all of the models that have made it into the UK this year seem to favour the Ford. And it’s not hard to see why. The cab environment is about as car-like as a commercial vehicle is likely to get, with the swooping panels and buttons putting us in mind of a current Ford Fiesta. With 155bhp under your right foot (a 125bhp engine comes as standard), this 6.7m-long ’van is not going to hang about. Factor in Ford’s talent for marrying superb ride comfort with nimble handling, and this is a proper long-distance cruiser. Our test vehicle benefitted from the VIP Pack, which brings with it a colour-coded front bumper and cab air conditioning. Climbing aboard, you enter into the rear of the Chausson Flash 610’s spacious lounge area, which has a wide L-shaped nearside sofa opposite a parallel bench that will accommodate two adults. With the cab seats swivelled, there’s probably room in here for six or seven people, four or five of whom can feasibly sit down at mealtimes, thanks to the multi-adjustable fixed table. There’s a real sense of space and airiness in here, too, enhanced by the lack of roof lockers – the reason for which we’ll come to in due course. Lighting appears a little minimal at first glance – there’s just one ceiling light – but the multiple LEDs therein positively flood the area with light at night. Turning left instead of right when you enter the Chausson brings you into the kitchen area, and again the Flash 610 ticks most of the boxes that matter. As is often the case with this sort of layout, worktop space is a little lacking, but the amount of storage space on offer goes some way towards making up for this. The twin drawers beneath the sink, for example, are huge, and the roof locker space is generous. Opposite, Chausson has squeezed a full-sized 175-litre fridge-freezer between the doorway and washroom wall, and fitted a spark-ignition Smev oven/grill unit above. In terms of sleep arrangements, the lounge area converts into a good-sized double by collapsing the table into its lowest position (achieved electrically by turning a key fitted to the bulkhead between the lounge and kitchen areas) and rearranging the cushions. But there’s another reason for collapsing that table – and that’s to liberate the second double bed hidden in this area. Twist another key – this one on what appears to be a ceiling moulding – and a huge double bed floats down from the roof. In two-berth mode, the bed drops as low as the top of the collapsed table, but if you have guests staying overnight, the bed can be halted higher up and accessed via a ladder. The rear of this motorhome houses the full-width washroom, and it’s undoubtedly one of this ’van’s star features. Quite apart from anything else, it is one of the biggest washrooms we’ve seen in a low-profile ’van – and as such opens up the sort of dressing room space most rivals can only dream of. A plethora of mirrors makes the area feel bigger, and the levels of storage are off the scale. Hanging space in the wardrobe along the rear wall is truncated slightly by the garage beneath, but there’s room enough in there for at least a month’s worth of clothing. The nearside rear corner is given over to the separate shower cubicle and it’s huge. It’s a simple affair, but is fully lined with a pair of shower-tray drains for fast emptying, even if the ’van isn’t pitched level. We love the contrasting black three-quarter-height moulding onto which the shower riser fits, too. The Chausson Flash 610 is also practical. The huge rear garage is both wide and tall enough to swallow a brace of bikes, and benefits from non-slip flooring, a dedicated blown-air vent and a couple of power points. Unusually, it has three access doors. The offside wall holds the toilet hatch and single (13kg) gas cylinder locker – the ’van’s diesel-powered heating necessitates only one cylinder – leaving the hook-up and water-fill points on the nearside. 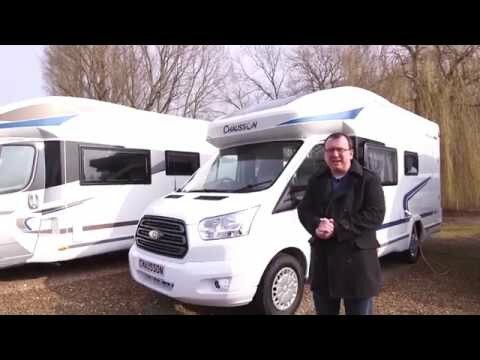 The Chausson Flash 610 offers great living space in a compact body on a superb-to-drive Ford base vehicle. As appealing to small families as it is to couples, we reckon this is cracking value.